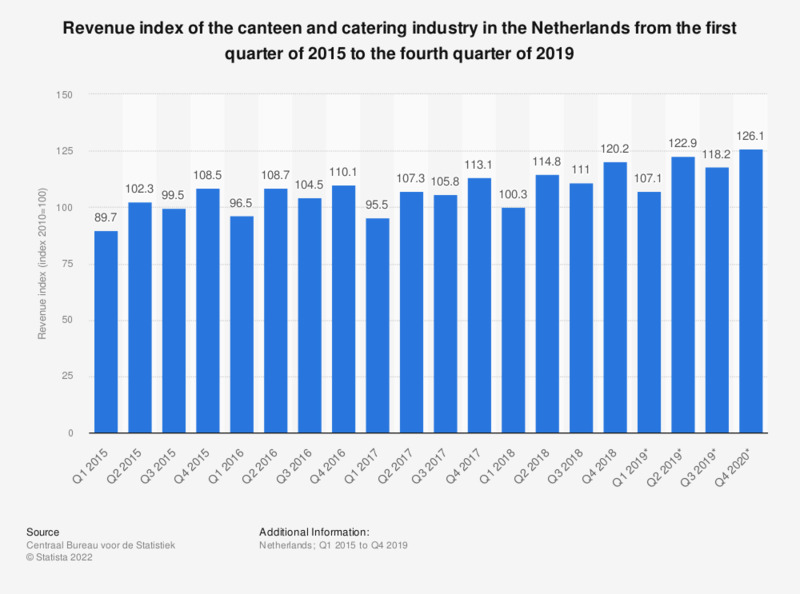 The statistic illustrates the revenue index of the canteen and catering industry in the Netherlands from the first quarter of 2015 to the fourth quarter of 2018. In the second of 2018, the revenue index was 115, slightly more than in the same quarter of the previous year. - Provision of prepared meals and small edibles for one-time events (event and party catering) like weddings, feasts, congresses, banquets and other special festivities. - Provision of prepared meals and edibles which are exclusively delivered home. - Entrepreneurial chefs, waiters/stewards (freelance). - Provision of prepared meals, small edibles and beverages to a large amount of people on the basis of a contract like in company canteens, school canteens and kitchens, university canteens, military canteens, hospitals, nursing homes etc. - Vending machines at school or company caterings. - Exploitation of sport canteens. - Exploitation of vending machines for food and beverages. * The figures for 2017 are provisional.